A few weeks ago, I started answering your questions about Dominaria, but you had so many I couldn't fit them into one column, so I'm back answering more of your questions. For those who might not read my Tumblr blog (Blogatog), the Rabiah Scale is a scale like the Storm Scale, but rather than talking about how likely a mechanic is to return in a Standard-legal set, it reflects how likely I think we are to return to a particular plane in a Standard-legal set. (Rabiah is the setting for Arabian Nights, and as it was a straight copy of another fictional world and not our take on the theme, it's highly unlikely we'll return there.) Remember that a 1 means we are almost certain to return and a 10 means it's highly unlikely we return, although not impossible. Before Dominaria came out, I would have said the plane of Dominaria was a 2c because there was a tiny sliver of a chance that our attempt to give it a modern sensibility would majorly crash and burn and we'd decide never to try again (me giving it a 2 means I was skeptical we'd never return even if this time went horribly). Now that the set is a big success, it's a solid 1. We'll be going back one day, and probably many, many times. For those who might not know, buyback was a mechanic created by Richard Garfield that first appeared in Tempest back in 1997. It goes on instants and sorceries and allows you to pay an extra cost to have the card return to your hand instead of being put into the graveyard. We experimented with bringing back buyback in Journey into Nyx and discovered it wasn't developable at a rate that would make the audience happy, so when we were looking for Dominarian mechanics to bring back, we scratched buyback off our list. The plan to return to Dominaria on the game's 25th anniversary was set into motion years before Richard was invited to join the design team. It might have happened sooner, but I didn't realize at the time that Richard was interested in being on another design team. As soon as I discovered he was interested, I called him the next day, and the set I offered him was Dominaria because I thought it would be such a perfect fit. The idea behind the cycle of legendary sorceries is that each represented a famous spell being cast. It was also important that the caster of each spell be someone who the audience would know. We also thought it would be cool if the spells came from different storylines. With these criteria, Kelly Digges, the creative member on the vision and set design teams, went and found what he thought was the most iconic spell to fit each color. He wasn't thinking in terms of Planeswalker or not Planeswalker, just famous characters. Kamahl was the protagonist in the Odyssey/Onslaught story and fit all the other criteria, so seemed like a perfect fit. As far as Kamahl being the only non-Planeswalker in the cycle, that isn't quite true. One, Yawgmoth was never a Planeswalker, although he did have technology that allowed him to travel between planes. Two, neither Urza nor Karn were Planeswalkers at the time of casting their legendary spells, although Urza would spark in reaction to seeing the destruction he wrought from that spell. Even Jaya was barely a Planeswalker, as that spell represents her spark igniting (in her case quite literally). So, the real question should be, why is Jaya the only character in the cycle that is a Planeswalker? One of the tradeoffs R&D has to constantly think about is the tension between the rules being as simple as they can be (the overall game of Magic is quite complex) and the colors each having a distinct identity. To help separate black from red, we've always had black use life loss as an effect while red deals direct damage (and even this has exceptions, as black draining effects use damage). In Dominaria, we're experimenting with having black do damage as an effect rather than loss of life to take two slightly different effects and just have them work the same. Life loss is easier to change to direct damage than vice versa, so that's what we're trying. The jury is still out on whether or not this experiment is a success. The primary audience for the Planeswalker Decks is new players. Note this doesn't mean other players can't enjoy them (most products have secondary and tertiary audiences), but when making decisions we tend to prioritize the needs of the primary audience. The Planeswalker Decks are meant as an introduction to the game. As such, we care about the flavor as much as the mechanics. One of our rules is we try to make sure the Planeswalker Decks can introduce main characters whenever possible. So, the decision was to put Jaya as a planeswalker in the set to appeal to the more enfranchised players and put Chandra in the Planeswalker Decks to let new players meet our main red Planeswalker. My "If your theme isn't at common, it isn't your theme" line isn't a rule, it's a maxim about making sure that the audience can understand what your set is doing. Really, it should be "If your theme isn't at high enough of an as-fan, it isn't your theme," but that isn't quite as catchy and it requires people knowing R&D lingo. When I first uttered that line, we didn't have many tools other than rarity to make sure players could see the themes. With new technology like the ability to collate themes into every booster pack, designers have a lot more options to make sure their themes can be easily seen and noticed. Probably the temporal accident at the Tolarian Academy. Time Streams by Robert King is one of my favorite Magic novels. The silliest story we talked about doing as a Saga was the duel between Worzel and Thomil, a story written by Richard Garfield in the Limited Edition (Alpha) rulebook. One of the first things we did in Dominaria design was make a number of lists. First was characters from Dominaria's past who were still alive and still on Dominaria—Karn, Jaya, Teferi, Jhoira, etc. Second were characters from Dominaria's past who were dead, but there was a through line we could connect to a new character—lineage, fulfilling the same role, connected by a special object, etc. Third were characters that were new but played up some aspect of Dominaria—from a certain location, connected to a known tribe or organization, of a certain unique race, etc. The first list was the shortest, but still surprisingly long considering how much time had gone by. The second and third lists were quite long. With only 44 legendary creature slots and three planeswalker slots, a lot get left out, but that just means we'll have lots of opportunities when we return to Dominaria again. To specifically answer your question, all the characters I most wanted (stuff from my time writing—Karn, Squee, Multani) made it into the set. While some of the Weatherlight crew got references, there were others I would have enjoyed seeing like Tahngarth or Ertai. I've talked numerous times about how Dominaria was a difficult set to consolidate into a single setting because so much had happened here. One of the suggestions was to only revisit a particular place on Dominaria. The set could be called "Jamuraa," and we'd only visit the one continent first seen in Mirage. The reason we didn't do this was that we wanted to capture the completeness of Dominaria's history and not just focus on one aspect. Dominaria allows anyone who's ever played any set from Dominaria to enjoy it, while "Jamuraa" would only be for fans of Mirage. Also, treating Dominaria like it was secretly six or so different planes wouldn't capture what makes it so special. Nostalgia sets are fun because I get to tap into my inner Magic fanboy. For example, talking about what Sagas we could do allowed us to share all of our favorite stories from long ago. The same is true for characters and creatures and artifacts and lands. Every decision was like running through a candy store picking out my favorites. This was particularly fun for me because my largest involvement in the story was set on Dominaria (okay, the story started on Dominaria), so I got to revisit a lot of things I personally created. Let me answer for "Where the hell is [character I love]?" I believe that, in total, 33 Magic expansions are set on Dominaria (or Rath, which later got overlaid onto Dominaria). That's about ten years of Magic. That's a lot of characters. We tried to make as many references as we could. We made it a point to touch upon all the various stories. But no matter what we did, we were still limited to a single large set, which meant that not everything was going to fit. This was one of the reasons we chose to make Dominaria "history world." There's a lot of history and Dominaria touches upon only a fraction of it. We can return many times and touch upon facets we didn't hit on the previous visits. One of those times, I guarantee you will see a reference to Sol'kanar. because if you made a list of the all-time most famous Swamp Kings, he's way up there. We did talk about it. We wanted Dominaria to have some high-octane reprints, which means we discussed just about every high-profile card that potentially could come back. In the end, we decided we didn't want to bring Counterspell back to Standard and chose to pass on it, but there was honest discussion about it wherein we weighed the pros and cons. 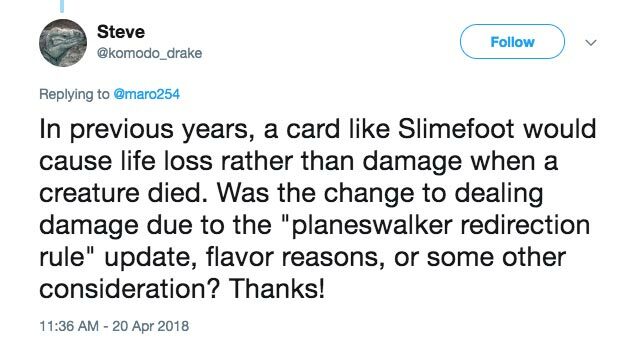 One big thing: Ethan Fleischer had originally come up with the one legendary creature per booster pack concept as a cool thing to do in Salad, and when Salad turned into Core Set 2019 he gave the idea to Dave Humpherys, Dominaria's set design lead (Erik Lauer started set design and handed it off midway to Dave Humpherys). The uncommon legendary creatures in Dominaria were created as an adjustment specifically for this set. As I explained above, you need a certain as-fan (the percentage at which things show up in a random booster) to make your theme work, and legendary creatures are a big part of the "history" theme. That said, the positive reception to all the uncommon legendary creatures has definitely led to some discussions in R&D. I don't know the outcome yet as the talks are still ongoing (and remember, we work ahead, so changes don't appear right away), but it's possible we could tweak our philosophy about legendary creatures at uncommon based on the reaction to Dominaria. Here's my little play about what happened. As always, I'm using some dramatic license. Aaron: Okay, so we're here today to plot out the next few years. We have a list of potential worlds, each with a rough idea of what mechanical themes we'd connect to it. To start the conversation, I've had the creative team put the worlds in an order that they think might tell the best story, but I want us to examine this list from every angle and we can swap things as we need. Janie (there is no actual person named Janie, but I forgot who said this and I felt bad about attributing it to the wrong person): Hey, wait a minute! If we move "Return to Dominaria" back a year it would be on Magic's 25th anniversary. Aaron: Given that "Return to Dominaria" is now the spring of 2018, how do we want to plan around it? Mechanics we use all the time are called evergreen. Deciduous mechanics are things we don't always use but designers are free to use whenever they want to. Hybrid mana, double-faced cards, and protection are all deciduous things. To understand the potential for deciduousness, let's look through the lens of mechanics, flavor, and graphic design. Mechanics – Sagas are just an enchantment subtype and we do enchantments every set. Also, the gameplay is pretty open-ended, meaning it would work in most sets. So, sure, we could do it. Flavor – Sagas represent stories. Every world has stories, and it would be a cool way to fill in some of the world's past. Unlike Dominaria, though, few worlds have stories the audience already knows. So, it would make some extra work for the creative team, but sure, we could do it. Graphic Design – Sagas have a very distinctive look and I don't think we could do them without maintaining that look, partly for functional reasons, partly for audience-expectation reasons. Each set has its own graphical design needs, and I'm not sure every world is going to want Sagas in addition to other things that are going on. So, this is the area that might cause Sagas the biggest problem in being deciduous. It's not that they couldn't be deciduous, but rather that if they became deciduous, that wouldn't mean any set could automatically use them. The popularity of Commander has changed the value of the "legendary matters" theme, enough so that we felt it was worth taking another swing at it. Note that Dominaria took the lessons of Champions of Kamigawa block and did some things differently—the two major things being making a broader "history" theme and using newer collation technology to up the overall as-fan. Brawl as a format didn't exist inside the building until Dominaria was almost done with set design, so it was more an inspiration of Dominaria than an inspiration for Dominaria. That's all the time I have for today. I want to thank everyone who took time to send in a question. As always, I'm eager to hear your feedback both on today's column and answers and about Dominaria itself. You can email me or contact me through any of my social media accounts (Twitter, Tumblr, Google+, and Instagram). Join me next week when I examine what exactly a game is. Until then, may your own sagas play out in Dominaria.